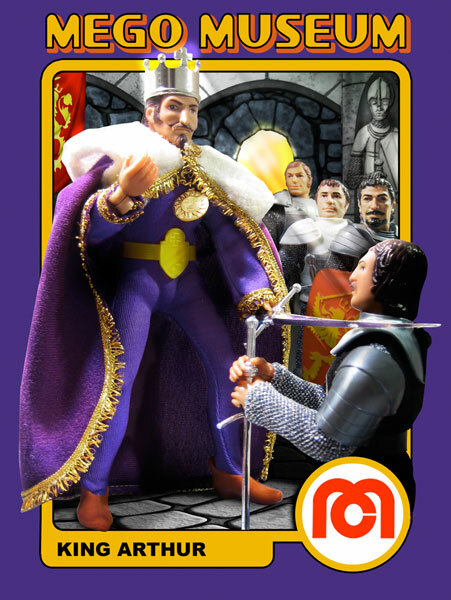 King Arthur comes with a silver chromed crown, faux fur-lined cape, crest-embossed plastic yellow belt, sun symbol necklace and broadsword. Uses same head as Mego Buffalo Bill, but his brown hair. Arthur’s shoes are brown versions of Robin’s slippers. slippers and gold painted crown. 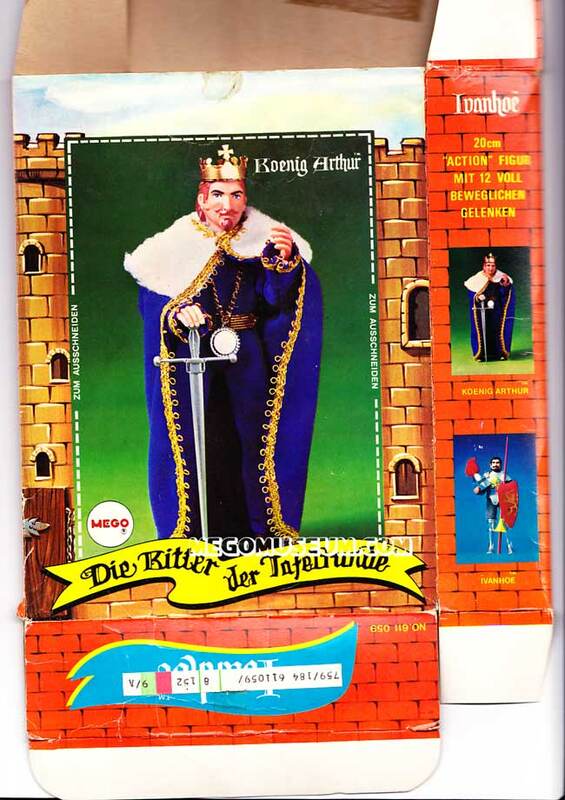 In Germany, four of the Super Knights were offered in two packs, Arthur was packed with the Ivanhoe. Scan courtesy of Gerhard. 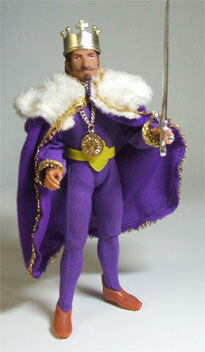 King Arthur wears a purple jumpsuit with gold trim on the cuffs of the sleeves. This jumpsuit has been reproducted by Classic TV Toys. The reproduction is a little deeper in color and the gold trim has a more rounded edge. 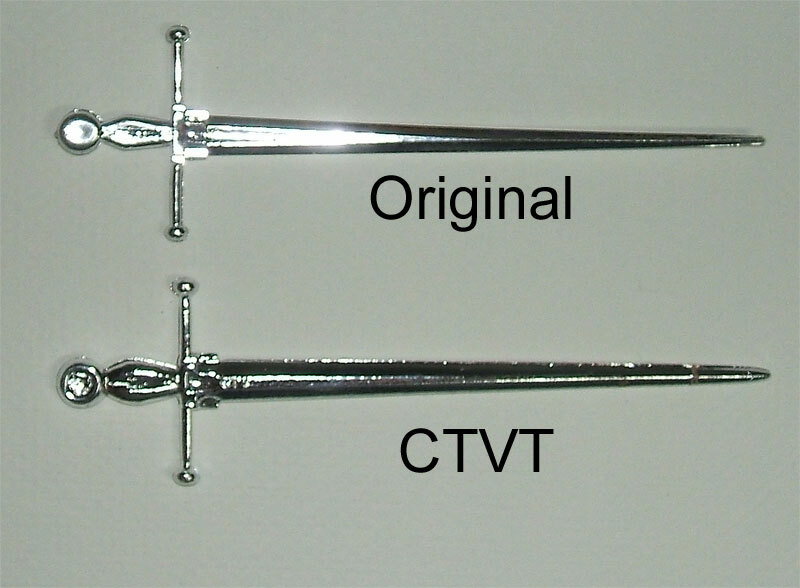 The newer repro material is smoother, more slick than the original and the repro is unmarked. King Arthur wears a gold and fur trimmed robe over his jumpsuit. The robe has been reproduced by CTVT. The repro is a little darker material, and much more shiny than the original. The gold trim has bigger, more rounded loops in it, and the white fur on the repro is much shorter than the original. The repro is unmarked. Like all macho men Arthur wears a gold chain necklace, this one with the sun on it. 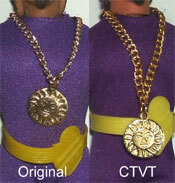 This necklace has been reproduced by CTVT. 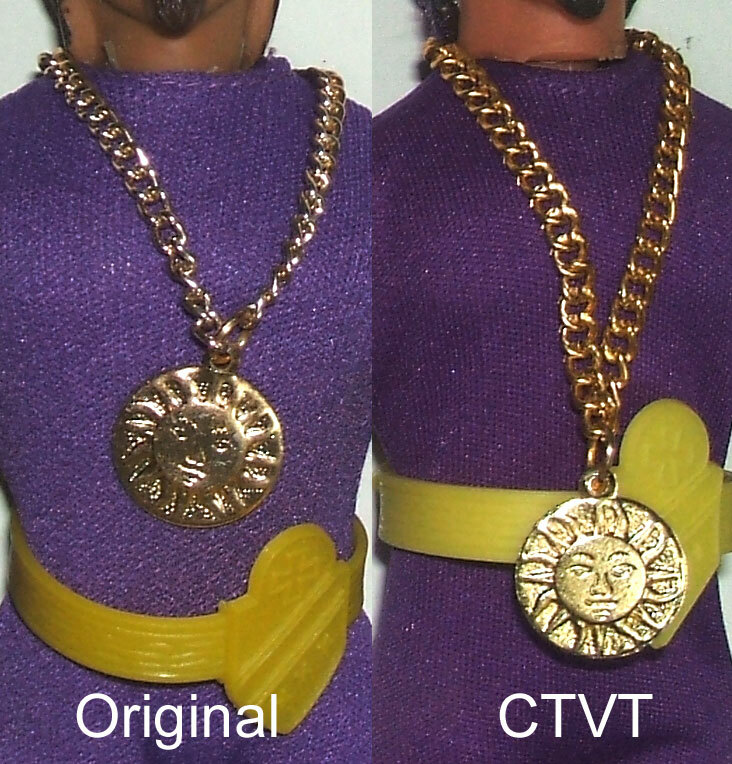 The repro has a little thicker gold chain, and the chain is quite a bit longer than the original, so it hangs much lower. The repro is unmarked. Another example of Arthur’s manhood, is his belt with the large belt buckle. Since he carries no shield, guess he figured might as well have a shield shaped belt buckle large enough to ward off attacks. Arthur’s belt has been repro’d by CTVT. The repro is a brighter, more solid yellow, while the original is more translucent. The points on the bottom of the shield are more rounded on the original, and very pointed on the repro. The repro is marked CTV on the inside. 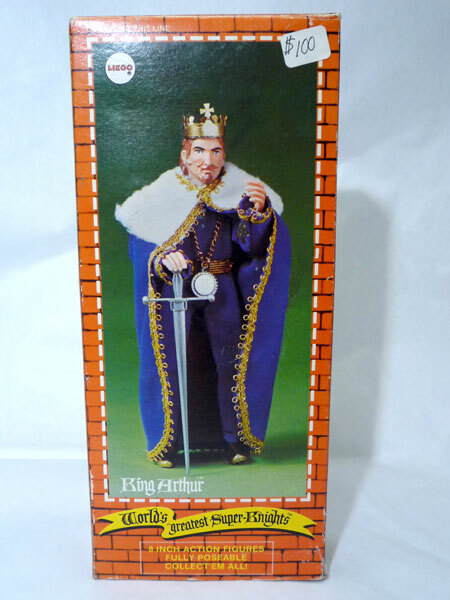 King Arthur wears a crown that isn’t as unique to the character as one might think. 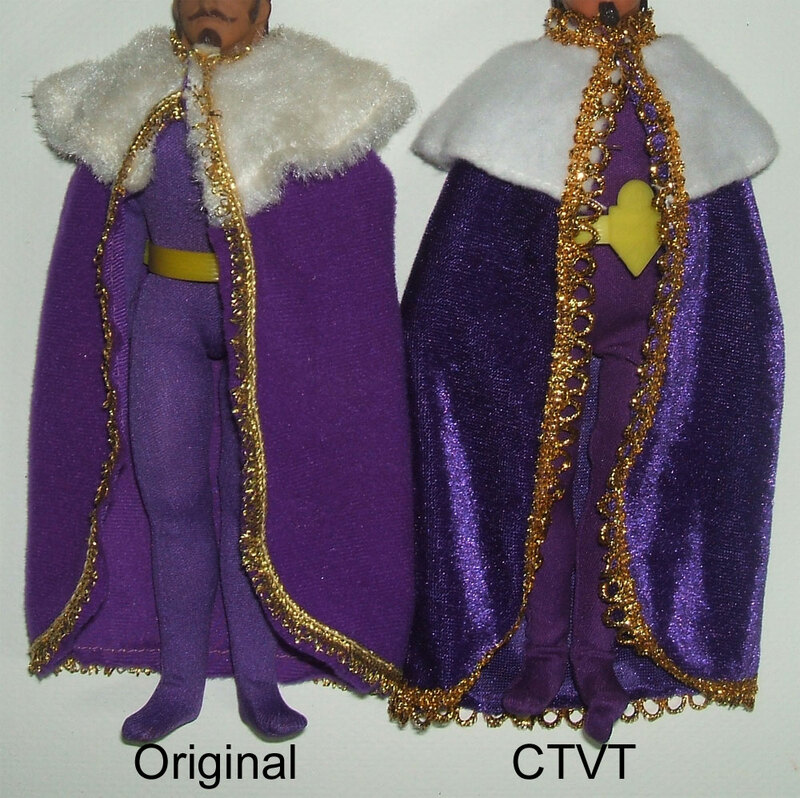 Mego used this crown on another figure as well. The Prince from the Puppet Love line. Although the Prince’s crown is slightly modified with little tabs with holes in them, it is basically the same crown otherwise. If you have these holes, you have a Puppet Love crown. 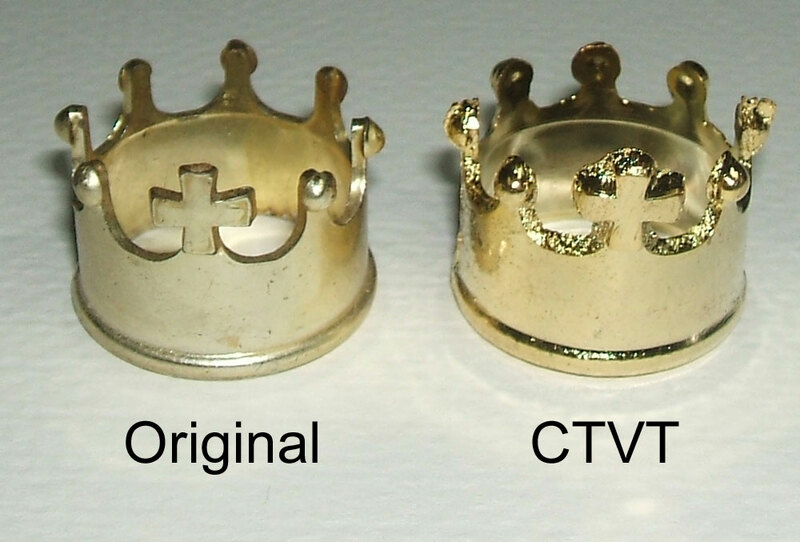 The Arthur crown has been reproduced by CTVT. The repro is very rough around the edges so very easy to spot. The original is very smooth around the cross and points. 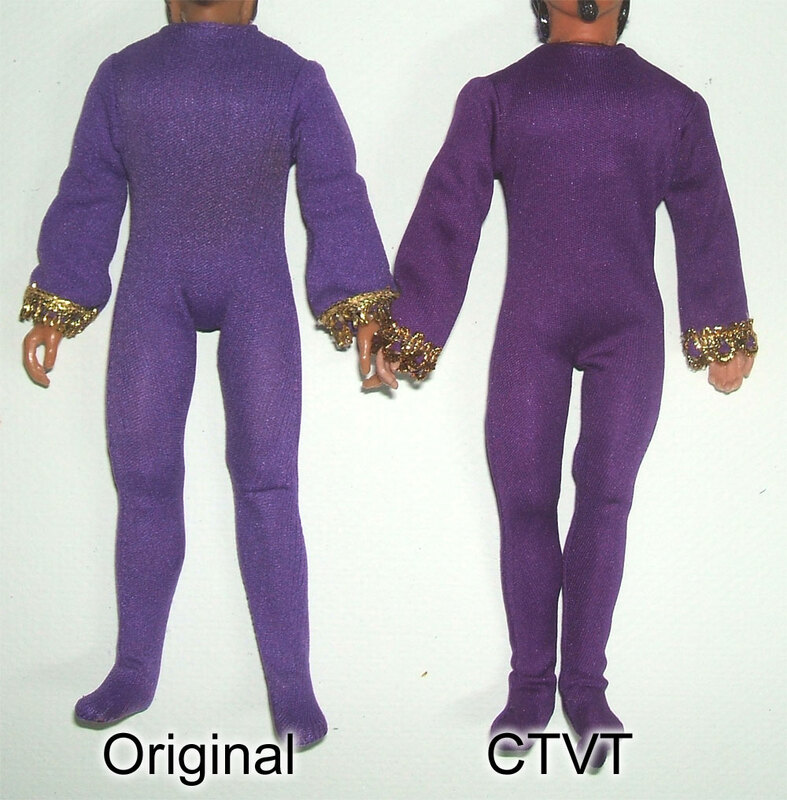 The repro is marked CTV on the back. King Arthur wears a light brown version of the Robin shoe. 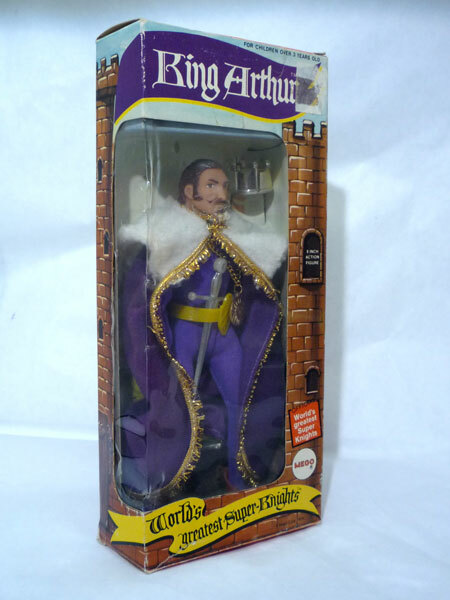 This color is unique to Arthur. 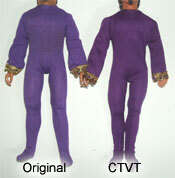 The shoes have been reproduced by CTVT. The repro’s are just a little bit lighter in color, are made of a stiffer material, are just a touch longer and are not as smooth as the originals. They are marked CTV on the inside.